Are you tired of your Facebook profile, but need to keep in touch with contacts on Messenger? Here’s how to deactivate your account and use the app only. Are you growing tired of Facebook but still want to chat with your friends via Facebook Messenger? You can! With the standalone Facebook Messenger app, and you don’t need to use a traditional Facebook profile. A lot of people don’t know that’s possible, but it is. Instead of signing up for a traditional Facebook profile, you can download the FB Messenger App, and instead of logging in with your Facebook profile, choose “Create a New Account” which will not create a Facebook profile but will allow using the app. But most people already have a Facebook profile, and if that’s you, here’s how to deactivate it and just use FB Messenger. This is probably where most people are at right now. 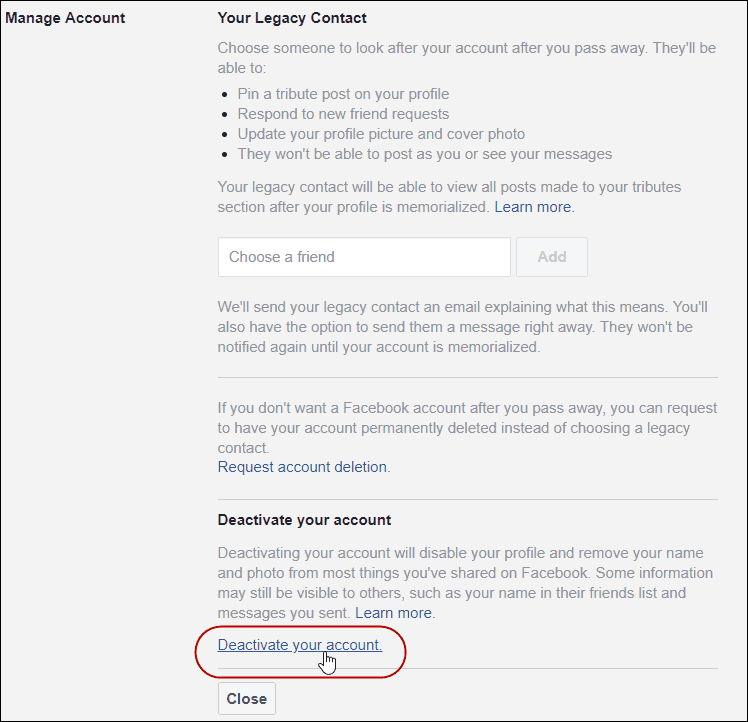 You have your Facebook account, don’t want to use it, but need to stay in touch with people from your Messenger list. 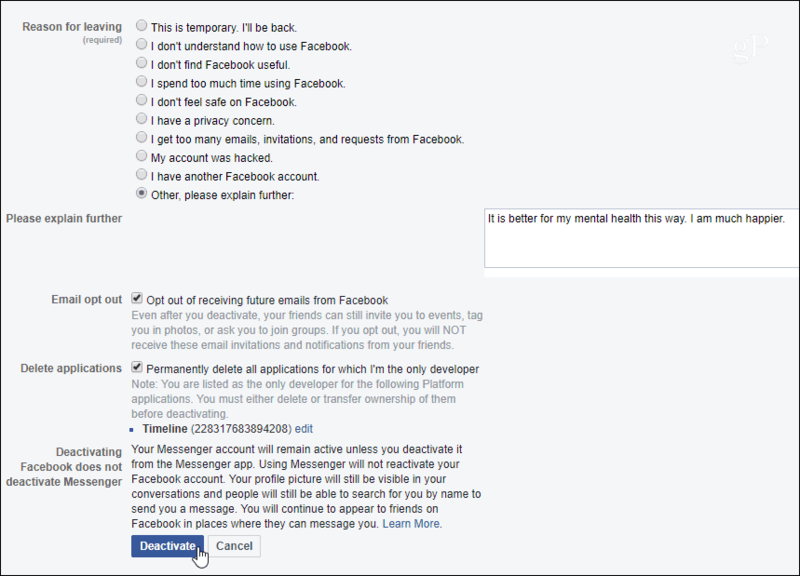 Also, you might want to have the option to go back to your regular Facebook profile someday. This is where deactivating your account comes in, and it’s easier than you might think. Launch a browser on your computer and log into Facebook. Then head to Settings > Manage Account. At the bottom of the section click the “Deactivate your account” link near the bottom. You will then need to enter your account password a second time. Next, you will get a short questionnaire on why you’re deactivating your account. To get out quickly, just click the “Other” option. If you choose anything else, it will pop up more suggestions with links that try to prompt you to not deactivate your account. Then you will need to verify that you are sure you want to deactivate your account. Now, it’s important to know that deactivating your account is just getting rid of your profile — your name, photos, and some things you have shared. You’re essentially pressing the “pause” button. It doesn’t get rid of everything and some info will still be visible to others. And this will allow you to reactivate your profile later if you want to. You just need to log in with your current account credentials. The idea here is you are getting rid of your profile, the news feed, and the rest of the traditional interface. Moving forward you can simply keep in contact with your friends and family via the Facebook Messenger app only. If you do want to completely and permanently get rid of your Facebook account, read our article: How to Permanently Delete Your Facebook Account. After that, if you want to use FB Messenger, again, just download the app and sign up with a new account. You can download the standalone Facebook Messenger app for iOS and Android or use the FB Messenger web app from any device. Or, on Window 10, you can download the Facebook Messenger UWP app from Microsoft Store.